Chess is one of the oldest games in the world. But no one knows the origin of chess. It is believed that chess is about 1500 years old. There are two main theories about the origin of chess. Some people believe that chess is originated in India in 600 AD. Other believe that chess was originated in the dragon country, China. The Chinese had a similar game called ‘Xiangqi’ in 2nd century. Chess existed in India from 6th AD. However it was something different from the modern chess. Chess was called ‘Chaturanga’ at that time. There were four parts to the ancient Indian army - infantry, cavalry, elephantry and chariotry represented by pawn, knight, bishop, and rook respectively in modern chess. According to a tale, Indian King Balhait requested Sissa (a scholar known for his analytical reputation) to create a game which should be a completely mental game. Sissa created a game which was called Chaturanga at that time. 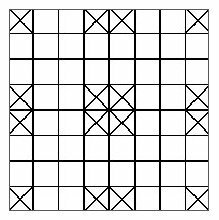 When the King asked Sissa to name a reward for such a wonderful game, Sissa replied that he wanted starting from one grain on the first square, two on the second, four on the next, eight on the next and so on. He wanted them to put double the amount of grain on each square for the entire chess board. He would take all of the grain when each square on the board was filled. The King was very happy because he thought it would not come to much. But he was quite wrong. Actually it began to build up very quickly. It went from 16 to 32 to 64 to 128. That was the first row and that didn't seem too bad. But in the second row it went from 256 to 512 to 1,026 to 2,052 to 4,104 to 8,208 to 16,416 to 32,832. At this stage the king's mathematicians were realizing that it was going to run to a colossal figure. It would bankrupt the kingdom. No one knows exactly how the King resolved the problem but Sissa was not seen much after that. King: moves similarly to modern chess rule. Queen: moves only one square diagonally. Bishop: can move two squares sideways or front-and-back (no more or less), but could jump over a piece between. Knight: similar to modern chess. Rook: similar to modern chess. Pawn: was allowed to move only one square forward. It was promoted only to queen. From India, it spread to Persia. Persians called it Chatrang which eventually changed to Shatranj. Now some rules related to Chaturanga were changed. As time passed, players started calling Shah 'King'. When they attacked the opponent’s King ‘mat’ was used when they believed that the opponent's King had been captured and lost the battle . In modern chess ‘mat’ is generally known as ‘checkmate’. Oldest recorded chess game was played between a Baghdad historian and a pupil. Although it is believed that Chess was originally discovered in India, a game which was converted from Chaturanga, called Xiangqi, was introduced in ancient China. In Xiangqi pieces were placed on the intersection of lines. A retired accountant and translator of Cantonese, David H. Li, suggests that general Han Xin drew on the earlier game of Liubo to develop an early form of Chinese Chess in the winter of 204-203 BC. Modern chess was introduced in Europe in 15th century. First World Chess Championship was held in 1886. That story about the grain multiplying on every square is one of the great old stories of chess. I've heard it many times in my life. Never gets old. Join in and write your own page! It's easy to do. How? Simply click here to return to Great Debate on the Origin of Chess.